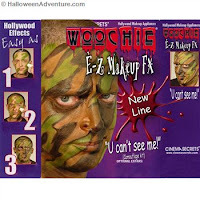 blog.HalloweenAdventure.com | Latest News from the Costumes Trend FrontLines! : Makeup, Makeup, Makeup! If you plan on being a vampire, a wolf, a zombie, or anything that might require some blood, you have to have our Blood Gel.Blood Gel is a deep red syrup-based blood that never dries, giving the look of oozing, wet, thick blood. Washes off easily with soap and water. Apply with a paint brush, Q-tip, or your finger. No clown costume is complete without a full out face of makeup. Sure, that red nose is important, but the white face and special designs are the most important part! Our Bozo Makeup Kit is the easiest way to get all the makeup you’d need for a clown costume in one place. Make-Up kit includes large tube of white cream make-up, six mulitcolor crayons (white, red, black, blue, green and yellow) and one applicator sponge. Use the sponge to cover the entirety of your face white, then use the crayons to draw fun shapes atop the white. Also check out another clown kit here. For more makeup ideas, check the Halloween Adventures Blog!